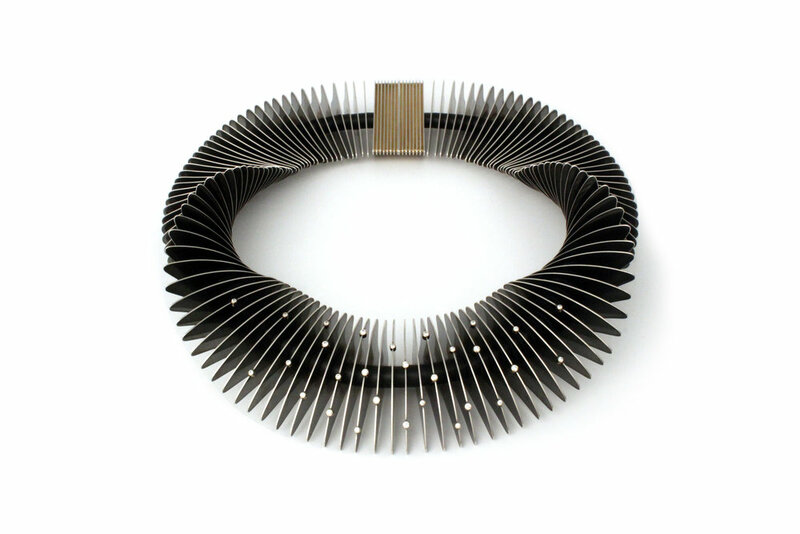 The Silver and Diamond Verto Necklace, completed in 2015, is one my Verto series. 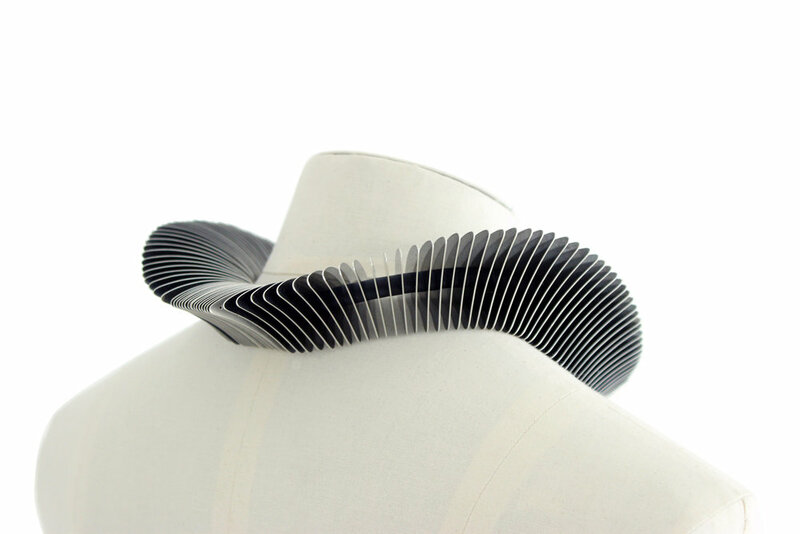 It comprises hand cut, silver discs, threaded onto a flexible, silicone core, which allows the necklace to mould comfortably around the necklace and shoulders, constantly adjusting to the wearer's movement. Twenty nine diamonds are set with 18 carat gold into the edges of the discs to appear like stars scattered on a night sky. It was my first attempt at stone setting. The faces of the discs are oxidised in contrast to the bright edges that describe a seemly solid form. The catch, made from thirty layers of silver, is magnetic. It took many hours to complete and is one of the most challenging pieces I have made to date. In 2016 I entered the piece into the Goldsmiths' Craft & Design Council Awards, where Joanna Hardy, of The Antiques Road Show, presented me with three awards: a Silver Award sponsored by Brown and Newirth, the IJL Gold Award and finally The Goldsmiths' Company Award, which is "given at the discretion of the Council for exceptional and outstanding design in 2D and 3D entries. It is only awarded when, in the Council’s judgement, an entry achieves the highest standard of design and originality." Later in 2016 it won a fourth award, the IJL Editor's Choice Award for Technical Excellence. 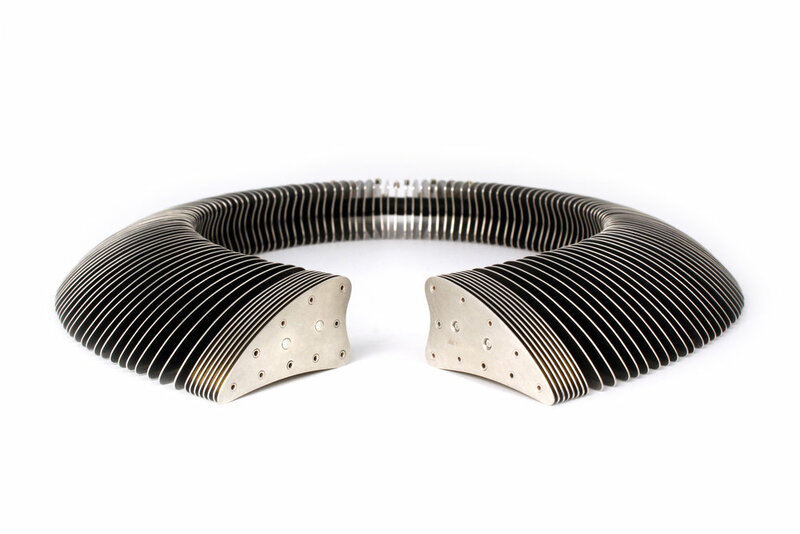 It has been exhibited at Goldsmiths' Hall, International Jewellery London, The Goldsmiths' Centre, SIERAAD Art Fair Amsterdam and SOFA Chicago. It has featured twice on the catwalk for L'Oréal and once on the red carpet at the premier of Jenna Lee's production of Little Lord Fauntleroy at the Peacock Theatre in April 2016. If you are interested in the Silver and Diamond Vert Necklace, or would like to discuss a similar commission, please contact the studio.